Good night, sweet Prince. The 57-year-old pop-music icon died today and as devastated music fans around the globe unearth their copies of Purple Rain to keep The Purple One alive, we look back on some of his most memorable moments on the small screen. On January 8, 1980, Prince and the Revolution appeared on The Midnight Special, performing I Wanna Be Your Lover and Why You Wanna Treat Me So Bad—lending serious funk to the Southern-Rock-heavy music hour. Appearances on such of-the-time shows as American Bandstand cemented his budding stardom with a diverse audience. 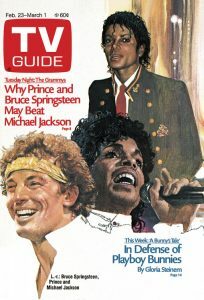 Prince appeared on the cover of TV Guide Magazine with fellow '80s icons Bruce Springsteen and Michael Jackson in February, 1985. He was one of the earliest artists to take advantage of MTV, and one of the few black artists whose videos were being played on the station during its early years. With innovative videos for songs like "When Doves Cry," "1999," "Little Red Corvette," "Kiss," "Raspberry Beret" and many others, however, he was impossible to ignore. He was so important to the network's legacy, that it changed its logo purple and pre-empted its afternoon reality repeats to play an hours-long block of his music videos, according to Billboard. In 1985, he collected the "Favorite Black Single" American Music Award for "When Doves Cry"—from the very white Janie Fricke and The Beach Boys. The fact that there was a category called "Favorite Black Single" back then says a lot about the state of the music business in the mid-'80s, doesn't it? In 1990, Prince returned to the AMAs to collect the American Music Award of Achievement from Anita Baker. In 2004, he was inducted into the Rock ’n ’Roll Hall of Fame, performing "While My Guitar Gently Weeps with Tom Petty, Steve Winwood, and ELO's Jeff Lynne. In 2007, he performed at the Super Bowl XLI halftime show, in an oh-so-fitting downpour. ... and rocked a fan-thrilling 8-minute set on SNL in 2014 (see highlights here). In November of last year, a hale-looking, guitar-toting Prince presented the Favorite Soul R&B Album AMA to The Weeknd. And though it wasn't captured on TV, Prince arguably gave the best performance of his career when he booted a certain other pop-culture personality off the stage and (for one shining moment) out of the spotlight.